For Vertical Fall Arrest Protection. A Component designed to work within the TUF TUG Safety System. 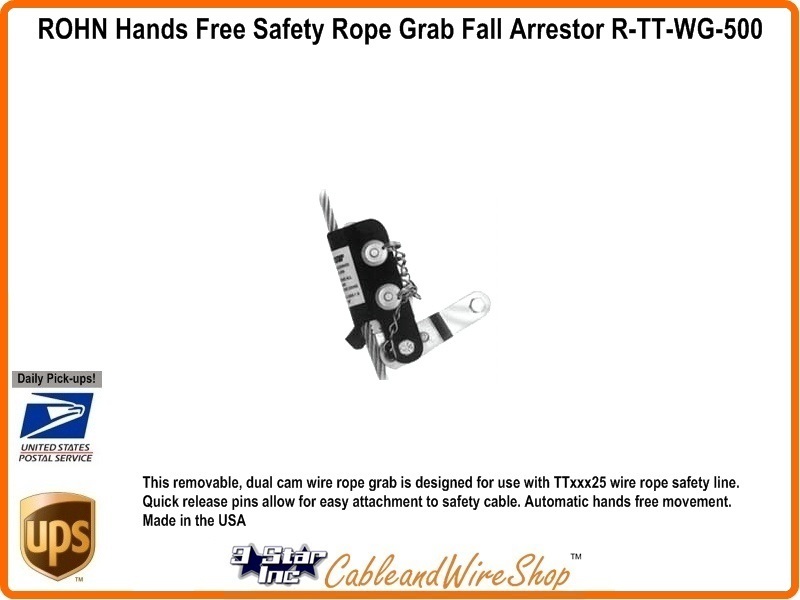 This is a Passive Fall Arrestor Dual Cam Wire Grab that will attach to your Harness and grab the steel strand running length-wise, up and down the Tower that was installed for this purpose. Features Dual Cams for Double System. For Use with the 3/8 Inch Diameter Solid Core Galvanized Wire Cable found in ROHN Product TT05025, TT10025, TT15025 and TT20025 Climbing Safety Cable Systems for ROHN 25G Towers. Automatically Travels with User. Conforms to OSHA Specifications and ANSI recommendations. Per Rev. G guidelines, any structure greater than 10 ft requires a climber safety device. Please see page 19 of the Buyer's Guide for ordering information. Note: This Vertical Fall Arrestor System works with the ROHN Safety Cable System Kits; TT05025, TT10025, TT15025, TT20025. Trust No Substitutes. Buy ROHN. Buy American.